The clearing of the site of Capitolias, with the assistance of Dionysos and other gods. CNRS News. Like other wondrous archaeological discoveries, the nearly 2,000-year-old burial was unearthed by chance in late 2016 during roadworks, in this case in front of a school in the Jordanian village of Beit Ras, just north of Irbid. Since then a team of local and international researchers has been studying the find, which they believe to be part of a necropolis in the ancient Greco-Roman settlement of Capitolias, reports the CNRS, France’s National Center for Scientific Research. The 52-square-meter tomb is divided into two burial chambers and contains a large basalt sarcophagus, all in very good condition considering that there are indications the tomb has been looted in the past, says archaeologist and epigraphist Julian Aliquot. It likely dates to the early days of the city, which was founded in the late 1st century C.E., Aliquot says, according to the CNRS report. The site’s most striking feature is the tapestry of paintings that covers the walls and ceiling of the tomb with scenes of pagan iconography as well as images of daily life. Some 260 figures are represented in the colorful panels that show gods banqueting merrily while humans bring them propitiatory offerings; peasants tending fields and vineyards, and construction workers building a rampart for the city. The paintings seem to represent various phases involved in the founding a city in the ancient Roman world, including consulting the gods on the appropriate site, clearing the plot, raising the walls, and finally, offering a sacrifice of thanks to the patron deity – in this case Jupiter Capitolinus, who gave the name to the city of Capitolias and was also the protector of Rome itself. "According to our interpretation, there is a very good chance that the figure buried in the tomb is the person who had himself represented while officiating in the sacrifice scene from the central painting, and who consequently was the founder of the city," says Pierre-Louis Gatier, a historian with the History and Sources of the Ancient World lab in Lyon, France. "His name has not yet been identified, although it could be engraved on the lintel of the door, which has not yet been cleared." It is rare to find such well-preserved and detailed representations of the founding of an ancient city. But the researchers were even more excited by the approximately 60 inscriptions that accompany the images. Some are tags identifying the ruling deities, which were written in Greek. No surprises there: The city of Capitolias, also known as Dion, was part of the Decapolis, a loose grouping of semi-autonomous Hellenistic cities on the eastern frontier of the Roman empire, between modern-day Israel, Jordan and Syria. However, looking closely, the researchers found other texts written using Greek letters but in Aramaic, which was widely spoken by the local Semitic peoples of the Near East. The fun part is that these writings look like nothing so much as the speech bubbles in comic books: the characters shown offer explanations of what they are doing or what is happening to them, says Jean-Baptiste Yon, another CNRS researcher. Yon gives some examples of these ancient (and not particularly humorous) comics from the scene of the construction site, in which one character says “I am cutting (stone).” Another, perhaps the victim of an accident, exclaims “Alas for me! I am dead!” Experts are still working on deciphering more inscriptions. These might not be the first comics in history: the ancient Egyptians also combined illustrations and texts to tell a story. Some even consider the depictions of hunting scenes on the walls of Stone Age caves to be the prehistoric equivalent of today’s graphic novels. It could be said these are the first-known Greco-Aramaic comics, and what is certain is that the mixing of the two main languages of the Roman Near East as was done in the Capitolias inscriptions is a very rare phenomenon, the researchers involved say. It also produces bizarre grammatical effects, such as the fact that the Aramaic words transcribed in Greek letters include vowels. Aramaic is written without vowels, as is its close linguistic relative, Hebrew. The writings from the tomb in Capitolias will offer a wide range of material for studies on Aramaic and its evolution, Yon concludes. They also tell us a lot about the atmosphere and inhabitants of this ancient town and its neighboring city states. The Decapolis – named like this because it initially included 10 cities, though it was later expanded to up to 14 – was formed starting in the 1st century B.C.E. and ranged from Damascus in the north to Philadelphia (modern Amman) in the south. 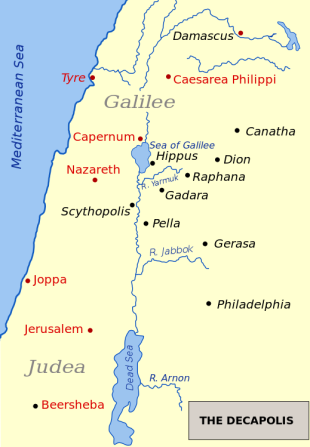 It also included two cities in what is today Israel, Beit She’an and Hippos-Sussita. While these Decapolis cities were intended to be friendly bulwarks of Greco-Roman culture on the restive frontier of the empire between Syria and Judea, they were clearly not impermeable to local cultural and religious influences. Judging by the texts in the tomb, the inhabitants spoke Aramaic in conducting their daily affairs, just like the other populations of the Levant. And, while the burial in Capitolias is unmistakably pagan, previous finds at another member of the Decapolis, Abila, have shown that at least some of these Hellenistic cities had a Jewish community. 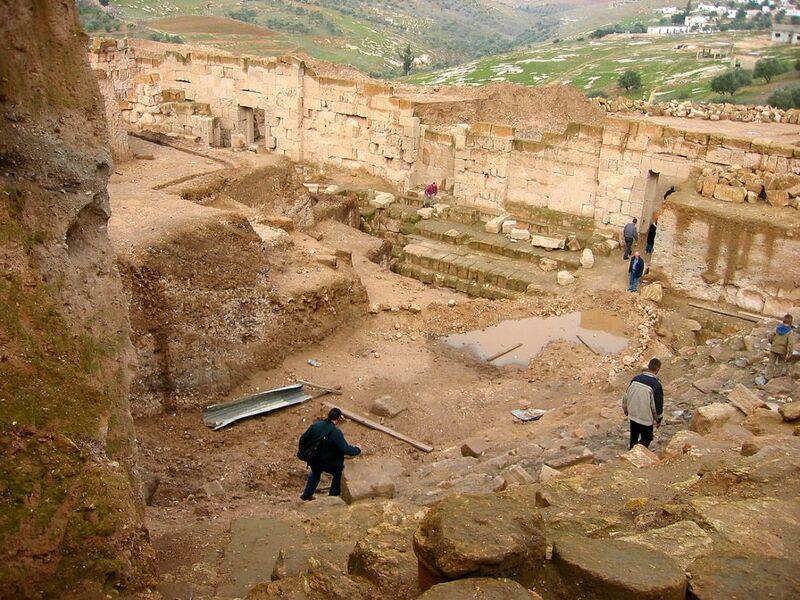 A deeper understanding of this cosmopolitan grouping of city states may emerge from further study of the Capitolias tomb, which is being supported by a consortium of French, Italian and U.S. institutions, as well as the Jordanian Department of Antiquities. The department’s general director, Monther Jamhawi, recently told the Jordan Times that authorities are also working to make the unique burial accessible to tourists.